My colleague Philip Klein had an excellent column Thursday on why he is a “Trump skeptic” but “not a Never Trump absolutist.” I associate myself with almost the entirety of his thoughtful essay. 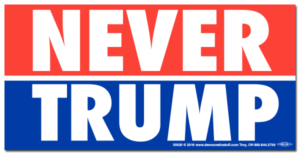 But I must also emphasize the important distinction that someone still can be “Never Trump” but not an absolutist. As Phil’s is just the latest (albeit one of the best) in a constant stream of pieces that take issue with (some of them belittling with fierce invective) some or all Never Trumpers, allow me to explain why I still welcome the label, and also what I mean by it. In doing so, I take strong issue with the sweeping generalizations and often outright calumny hurled at Never Trumpers in general even by usually thoughtful writers such as Victor Davis Hanson and my friend Mollie Hemingway. What I can’t brook is how these critics shout from the rooftops that Never Trumpers are irrelevant and yet in the next breath blame us for using our supposedly great influence in dastardly ways to harm their hero. No one can square that circle. First, let it be clear that I agree with Phil that the proper approach always has been to “criticize actions of [Trump’s] I disagreed with while giving him credit when it was due.” That alone makes me not one of the “absolutists” against whom Phil writes. Still, I remain a Never Trumper in the sense that, absent the appearance of a neo-Nazi or a Stalinist as Trump’s only main opponent, I will never vote for the orange billionaire for president. That doesn’t mean I will (or did) vote for a Democratic nominee over Trump. It doesn’t mean I even tacitly accept the idea that we face only a “binary choice,” in which failure to support Trump equates to support for the Left. It also doesn’t mean I oppose everything Trump does….